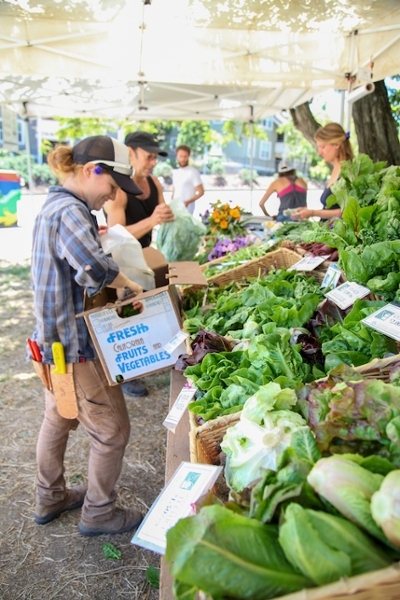 The UCSC Farm & Garden Market Cart will be open on Fridays from 12 noon to 6 pm through early November. Join us for Opening Day of the 2018 UCSC Farm & Garden Market Cart on Friday, June 1, marking another abundant season of fresh, delicious organic produce and beautiful flowers. The Market Cart is located at the corner of Bay & High Streets at the base of the UC Santa Cruz campus, and will be open from 12 noon – 6 p.m. on Fridays. Cash, checks, and EBT are accepted (please note that we cannot process credit cards). Early season offerings include organically grown blueberries, strawberries, broccoli, lemons, lettuce, arugula, salad mix, shallots, radishes, and a variety of greens including pac choi, spinach, and chard. Flower bouquets will also be available, along with packaged quinoa grown on the UCSC Farm. As the season progresses, shoppers can look forward to heirloom and dry-farmed tomatoes, sweet corn, broccoli, potatoes, sweet and hot peppers, apples, pears, basil, winter squash, and much more. All the produce is organically grown at the UCSC Farm and Alan Chadwick Garden by staff and students in the Apprenticeship in Ecological Horticulture, a farmer and gardener training program of UCSC’s Center for Agroecology and Sustainable Food Systems (CASFS). Please note that because we are supplying produce to expanded on-campus efforts to serve students experiencing food insecurity—including the twice-weekly Produce Pop Up farmstand, food pantries, and dining hall programs—the Market Cart will be open only on Fridays this year, rather than on both Tuesdays and Fridays as in past seasons. The Market Cart will be open through early November (weather permitting). For more information, call (831) 459-3240 or email casfs@ucsc.edu. Read more about ways to purchase produce and flowers from the Farm & Garden. See the CASFS website for more information on CASFS activities at the UCSC Farm & Garden.